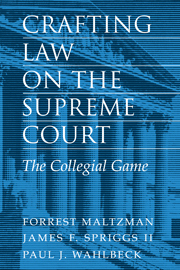 In Crafting Law on the Supreme Court, Maltzman, Spriggs, and Wahlbeck use material gleaned from internal memos circulated among justices on the U.S. Supreme Court to systematically account for the building of majority opinions. The authors argue that at the heart of this process are justices whose decisions are constrained by the choices made by the other justices. The portrait of the Supreme Court that emerges stands in sharp contrast to the conventional portrait where justices act solely on the basis of the law or their personal policy preferences. This book provides a fascinating glimpse of how the Court crafts the law. 1. Introduction; 2. Selecting an author: assigning the majority opinion; 3. A strategic response to draft opinions; 4. The decision to accommodate; 5. The politics of coalition formation; 6. Conclusion.